In February 1860 Stephen Douglas was the leading contender for the Democratic presidential nomination which was to be decided at the upcoming national convention in Charleston. 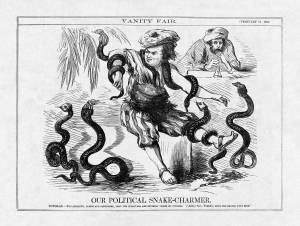 In this Vanity Fair cartoon he is depicted as a snake-charmer, precariously handling the snakes of various political parties and factions—Republican, Democrat, American, Old Line Whigs, Anti-Lecompton, and Southern American. The artist places John Forney, the editor of the Philadelphia Press and a major Douglas promoter, in the background as Douglas’s flute-player. Forney’s position is indicative of his key behind-the-scenes role in Douglas’s campaign.